I've always had a soft spot for Amy Tan novels as she was the first writer of Asian descent that I'd ever read. I still remember the first time I read The Joy Luck Club, a classic despite all the problematic bits. My sister had simply recommended it to me by saying "oh, you'll see our grandmother a lot in this." Tan's writing was seminal to me as it revealed that there were people out there telling narratives I could relate to and it opened my eyes to seek out more writers and to learn more about the ___ - Canadian/American experience. 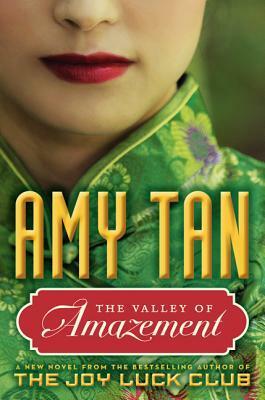 The Valley of Amazement was published in 2013 and follows the story of a mother, a daughter and a grand-daughter. Unlike most Tan novels though, the story takes place primarily in Shanghai, the mother is Caucasian, and she is the madam of a high-class courtesan house. From these unusual beginnings unfolds a story of tragedy, epic misunderstandings and the journey to find where one belongs across land, sea and race. The main protagonist of the book is Violet, the bi-racial daugher of a Chinese father who she never knew and her mother, a headstrong woman from San Francisco. Through her we learn all the intricacies of the courtesan world. Violet's life is full of tragedy and hardship, but through it, she exerts a strength to survive and endure that seems remarkable considering her circumstances as she believes that all who loved her have abandoned her. Certainly coming of age in a world where her virginity is auctioned off and she receives lessons on roleplay doesn't help that viewpoint either. The second part of the book continues the story with Violet's mother. Half of this part is a flashback to how Violet's mother fell for her father and followed him to China and then the other half is the aftermath of her and Violet becoming separated. Up to this point, as a reader you simply believe that Violet's mother is a selfish sociopath, but as you learn more about her past you see that yes, she kinda is, but she's also more than that. I quite enjoyed this story as it's unlike other Tan novels. The whole Chinese mother/American daughter, inter-generational story has been really played out and it's refreshing to see her explore new territory while still remaining within her niche. At its heart, this story is about survival and the enduring power of a mother's love. Tan really immerses you into the worlds she creates and the characters are very real, with imperfections, questionable motives and unlikeable traits. Above all, this book really makes you think about your own mother. Were the hurts she gave you actually attempts to protect you? In what ways did you hurt her with carelessness? How will you as a mother continue to make the same mistakes with your daughter?